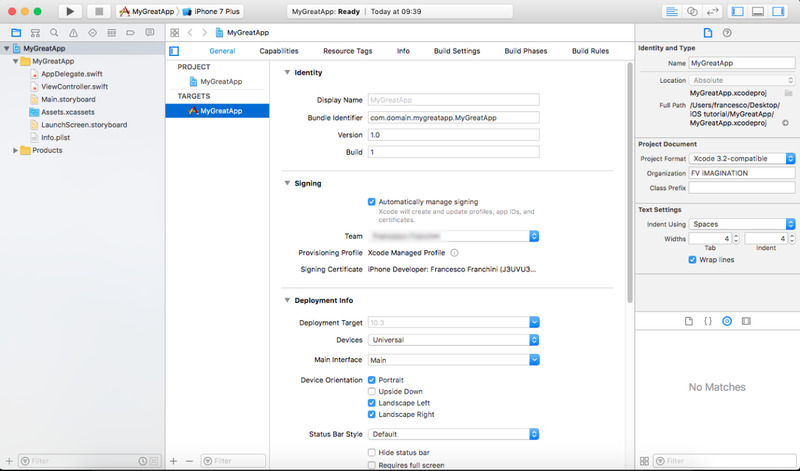 In this tutorial I'll cover the basic aspects of Xcode and its User interface. Right now the latest Xcode version is 8.3.3 and the Swift version is 3. Xcode is the only software you can use to build native iOS, macOS, tvOS and WatchOS applications, it handles both Objective C and Swift languages, supports Storyboards and code completion feature. You can download it for free on the Mac App Store, and of course you must own a Mac PC in order to work with Xcode, there's no Windows or Linux version available. So let's start by opening Xcode and click on Create a new project. For the sake of this tutorial I'll choose Single View Application in the iOS tab. Click Next and get to the app info window. 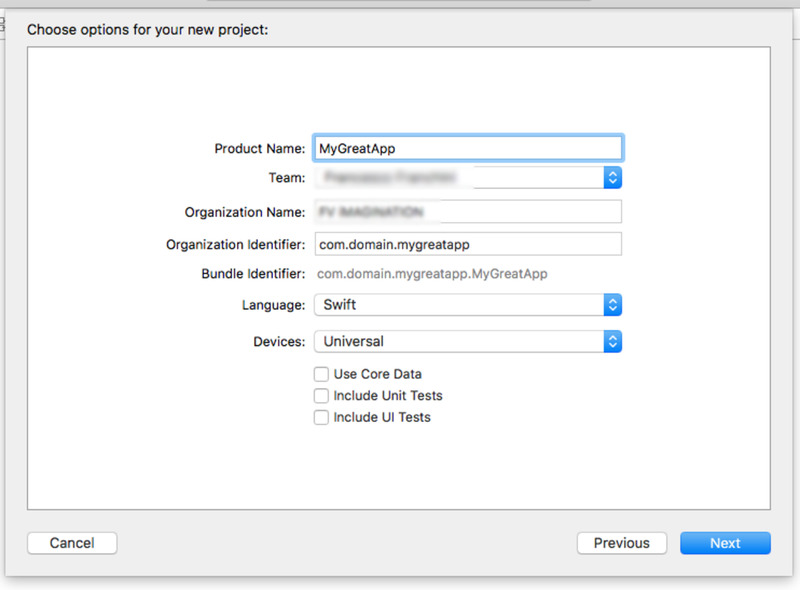 A name of your project - usually it's better to insert a name with no spaces, like "MyGreatApp" or just a single name. Language: Choose either Swift or Objective-C. Please note that for the sake of this tutorial I'll choose Swift language. Use Core Data: You can check this option in case you planned to integrate CodeData framework in your project. 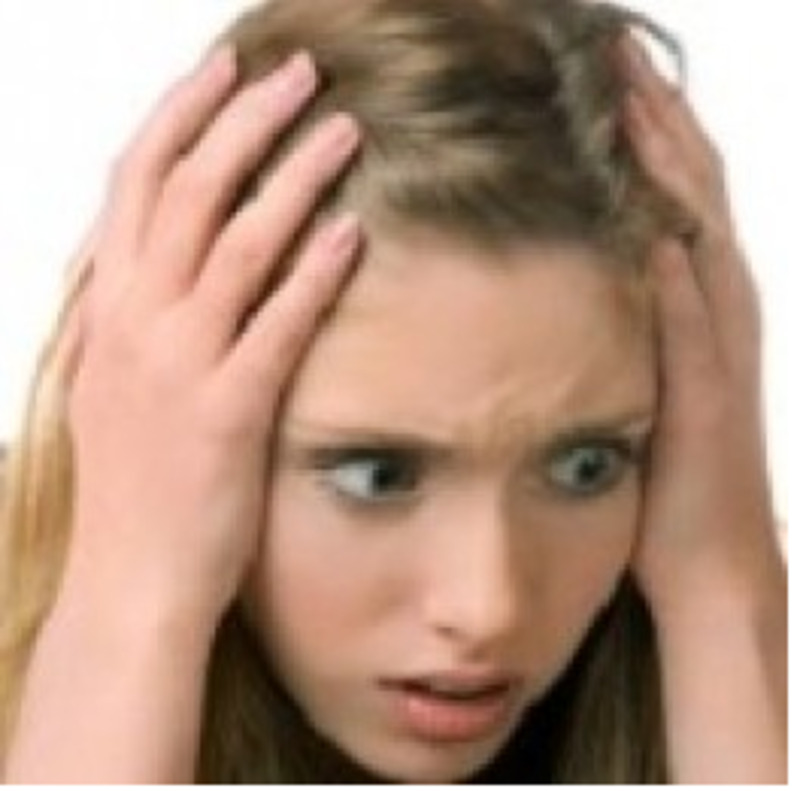 Xcode will generate the necessary files to handle CodeData code. Hit Next and save your project into a desired folder or on your Desktop by clicking on Create. Your new project has just been created, there's a brand new world on the screen of your Mac now and the first screen you get is the General tab where you can adjust the Bundle Identifier, the display name of your app, it's deployment target and a lot more. Let's start by seeing how it looks. Before getting into the General tab details I want to highlight the buttons on the top-left corner of the Xcode window and explain you what they are about. The screenshot below shows the basic commands tool. As the comments on the picture above say, this toolbar allows you to either run or stop debugging your application and the combo box is where you can choose the device you want your app to run on. As per Apple guidelines it's always good to test an app on a real iPhone or iPad with WiFi or 3/4G internet connection, because the Simulator may fail sometimes and it doesn't support camera and current location, so if your project needs those features you really can't test it on the Simulator. Right below the Debug toolbar you can find the Project toolbar where you can see the list of your files, search for them, see code issues and more. 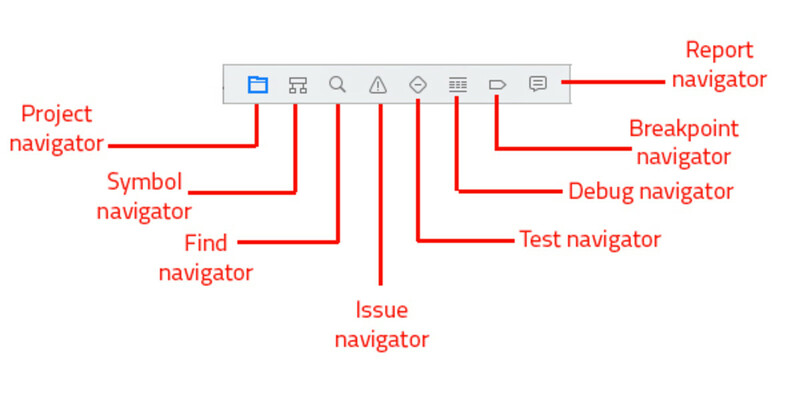 Issue navigator: if your code has bugs, this section will show them as a list and you'll be able to select each row and get to the line(s) that are not well written. You may also check the Xcode console on the bottom of the screen to better address your issues. On the top-right corner of the Xcode window you can find a set of buttons to control the layout of your environment and hide/show certain sections of Xcode. The picture above shows the names of the buttons, you can check them out on your own by simply positioning the mouse pointer over them and wait for a second for the alt box to show up. 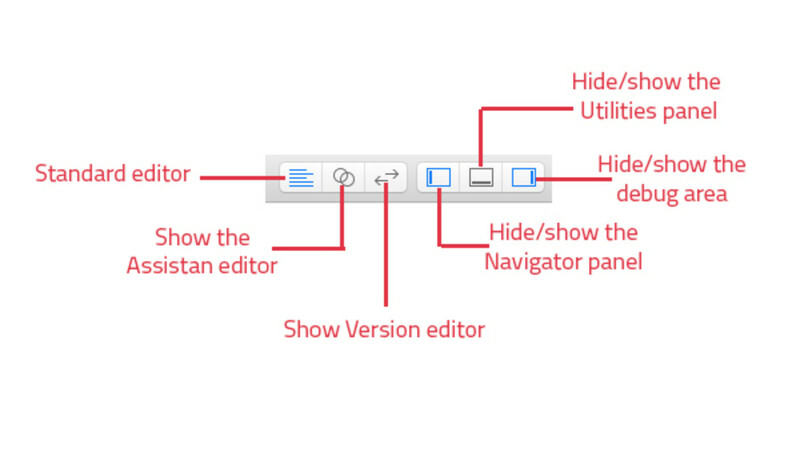 Show the Standard editor: This layout option is selected by default when you first create a new project. If you click on it, the central panel in Xcode will show the entire file that is selected in the Project navigator panel. Show Version editor: This option is useful in case you've changed some code in your swift files and want to revision them by seeing the differences between them. The center of the Xcode window will again by split in two parts and you'll see the left side with your new code and the right side with the old code. Hide or show the Navigator: Use this button to show/hide the left navigator panel. By default, this is always visible when you first create a new project. Hide or show the Debug area: By default, this button is disabled but when you run the app it will get enabled and show an extra window on the bottom of the screen: that's the console where you can log anything about your application, as well as see crash errors and debug messages. 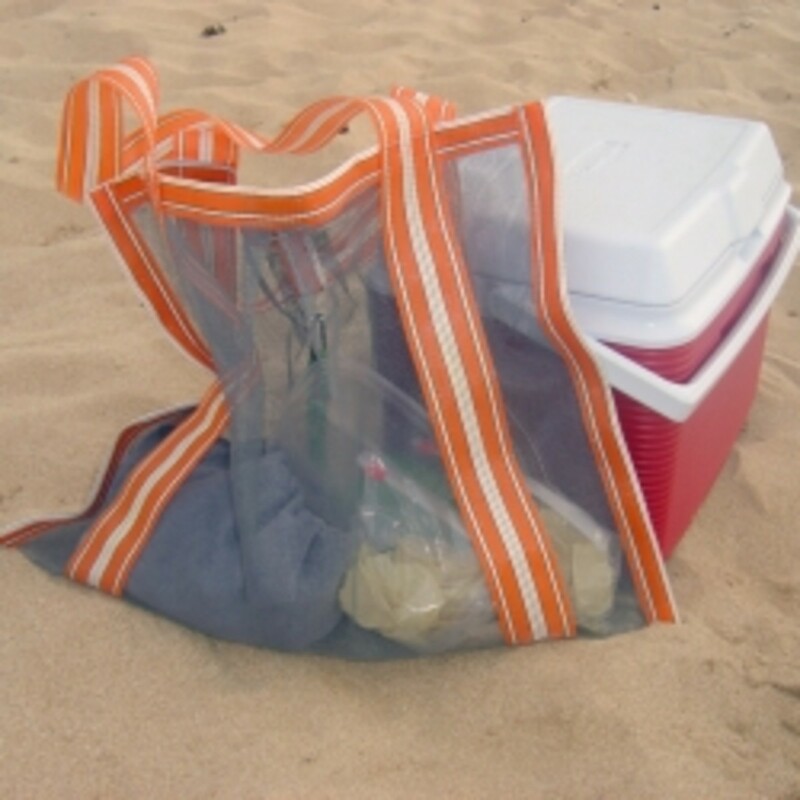 This tool is very important for developers, I would say that it's indispensable. Hide or show the Utilities: This button shows or hides the right side Utilities panel. I'll explain about this panel later because it's essential for your development. Finally, let's get into the General tab of the Editor section, which is the central side of the Xcode window. Here's where you'll do all the magic about building and setting up your apps. As you can see above, I've placed numbers next to each option of this tab, in this way I'll be able to explain you what they are for step by step. Bundle Identifier: Based on your settings in the first popup window you've got when you created your project (as previously mentioned), this option will show the bundle ID relative to your app. You can still edit it as you wish, for instance in case you changed your mind and renamed your app's Display Name. Version: By default this value is 1.0, obviously, and you should leave it as it is. You can change it in case you've updated your app and need to submit it to the App Store as an update. Build: Similarly to the Version, by default this value is 1, you must increase it every time you make an update and are about to Archive your project, because iTunes Connect will not process older builds. Automatically manage singing: Since Xcode 8 this options is always enabled and it's pretty useful. It gets info about your Developer certificates and creates and updates profiles, app ID's and certificates automatically. 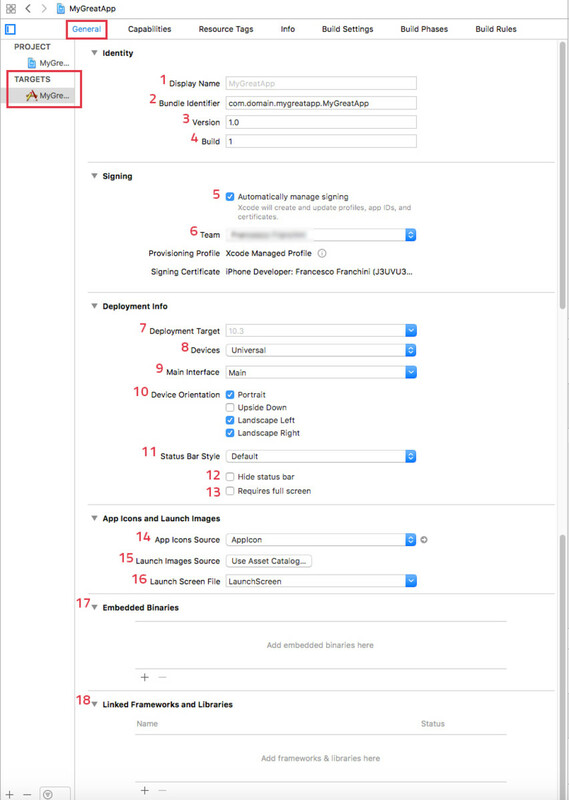 To be honest it doesn't always work properly because most of the times you still need to manually create an app ID on your Apple Developer Portal. We all hope that Apple will fix this little bug on a next Xcode release. Deployment Target: Here you can select the minimum iOS version of your app, I usually select 8.0 so I'll be able to run my apps on older devices too (like iPhone 4S and iPhone 5 SE). Devices: Choose if you want your app to run on all iOS devices, on iPhones or on iPads only. Main Interface: By default this field has the name of the main Storyboard of your project. Unless you'll add additional Storyboards (unusual), you should leave this value as it is. Device Orientation: Here you can set the allowed orientations by selecting the desired options. Status Bar Style: Choose either a default status bar (black) or a light one (white). 13. Requires full screen: This option is not checked by default, but it should, otherwise you'll see black areas on the top and bottom edges of the screen of your device when you'll run your app, so just make it true (check it). 14. App Icons Source: here is where you choose the Image Set for your app icons, by default Xcode already created an Image Set called AppIcon and you can find it in the Assets.xcassets folder. 15. Launch Images Source: When you create a new project, Xcode generates a LaunchScreen.storyboard file where you can place your splash screen image and views inside it, so if you want to use that just leave this option as it is and don't create any Image Set in the Assets.xcassets folder. 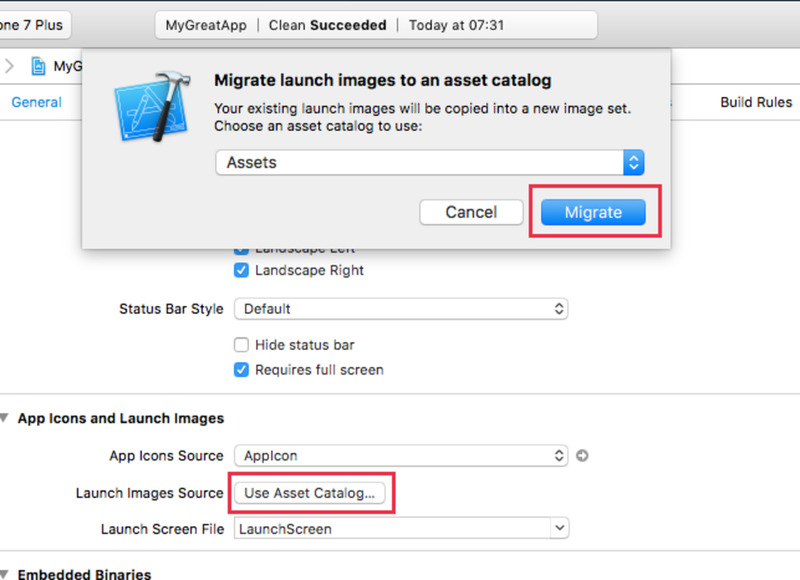 Instead, if you'd rather adding your own splash screen images for all devices, click Use Asset Catalog... to migrate launch images to an asset catalog. Xcode will create a LaunchImage image set where you'll be able to drag all the splash screen png's into. 16. Launch Screen file: This field hosts the LaunchScreen.storyboard's name as a reference to load it at app startup as a splash screen. If you want to use such storyboard file just leave this option as it is. 17. Embedded Binaries: This section is for you to attach third-party libraries to your project, for instance if you have included frameworks downloaded from GitHub, they may have libraries that need to be imported in your project. Click the + sign to do so. 18. Linked Frameworks and Libraries: Here's where you can add the .frameworks files from a list of iOS Frameworks or third-party ones, like GoogleMobileAds.framework, for example, FacebookSDK, or many other. 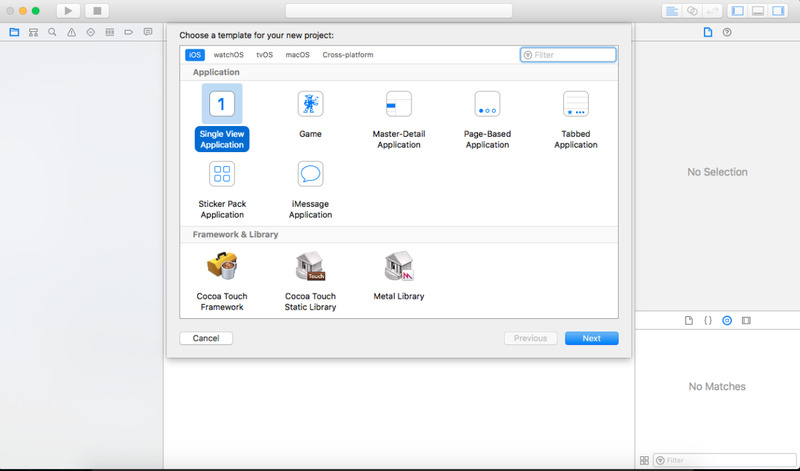 You can hit the + button and choose the desired Frameworks, once you select one Xcode will generate a Frameworks folder in the Project navigator panel on the left side. This is another important tab in Xcode where your can enable/disable iOS features such as iCloud, Push Notifications, etc. Click on the small arrows next to the Capabilities names to see what they are for. Game Center: This option allows player to connect to the Game Center service, enabling them to interact with friends, view leader boards, or play head to head in your game. Wallet: Wallet gives users a way to organize passes, tickets, gift cards, creadit cards and loyalty cards. Use the PassKit framework APIs to display, add or update items in your users' Wallets. Siri: Allows your application to handle Siri requests. Apple Pay: allows users to easily and securely pay for physical goods and services such as groceries, clothing, tickets and reservations in apps using payment information stored in their iOS device using Touch ID. In-App Purchase: this option lets you sell a variety of items directly within your free or paid apps, including premium content, virtual goods and subscriptions. Maps: With MapKit you can create routing apps that users can access form Maps. Your apps can provide specific directions beyond what the Maps app supports, including subway routes, hiking trails or nike paths. Personal VPN: allows your app to create and control a custom system VPN configuration. Network Extensions: lets your app create app-extension based clients for your custom tunneling protocol. Background Modes: UIBackgroundModes specifies that the app provides specific background services and must be allowed to continue running while in background. Inter-App Audio: allows your app to send audio to and receive audio from other Inter-App Audio-enabled apps. Keychain Sharing: allows your app to share passwords from its keychain with other applications made by your Team. Associated Domains: allows your app to associated with a specific domain for specific services such accessing Safari saved passwords and activity continuation. App Groups: allows access to group containers that are shared among multiple related apps, and allow certain additional interprocess communication between the apps. Data Protection: allows applications that work with sensitive user data to take advantage of the built-in encryption available on some devices. 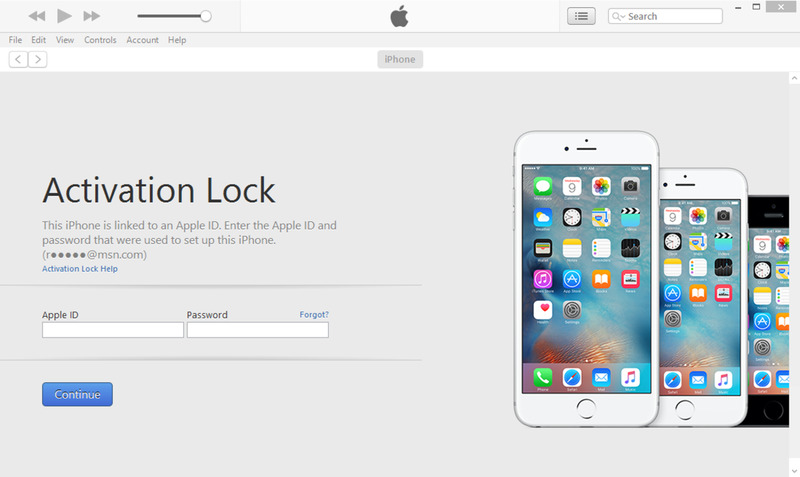 When your app designates a specific file as protected, the system stores that file on-disk in an encrypted format. HomeKit: allows your app to interact with HomeKit accessories and create home configurations. 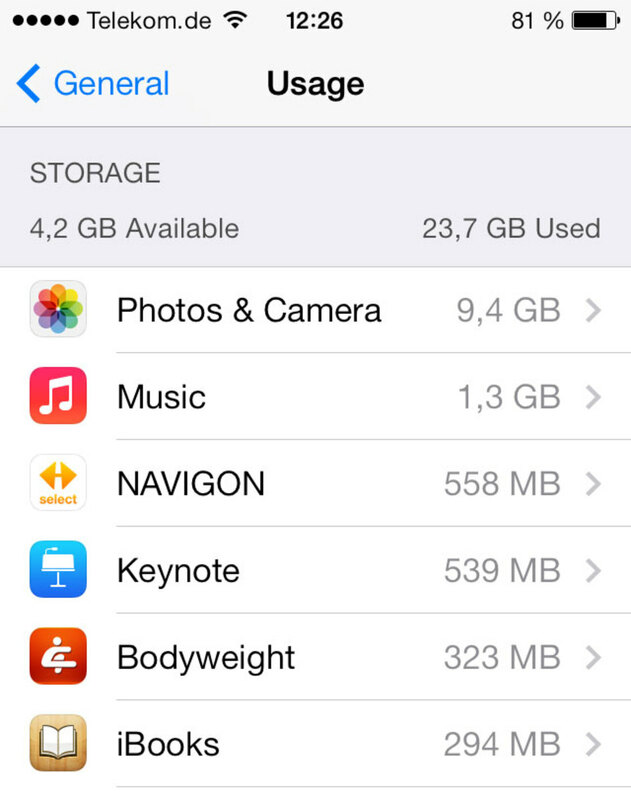 HealthKit: allows your application, with user permission, to store and retrieve personal health information. Wireless Accessory Configuration: allows your app to configure MFI Wi-Fi accessories. 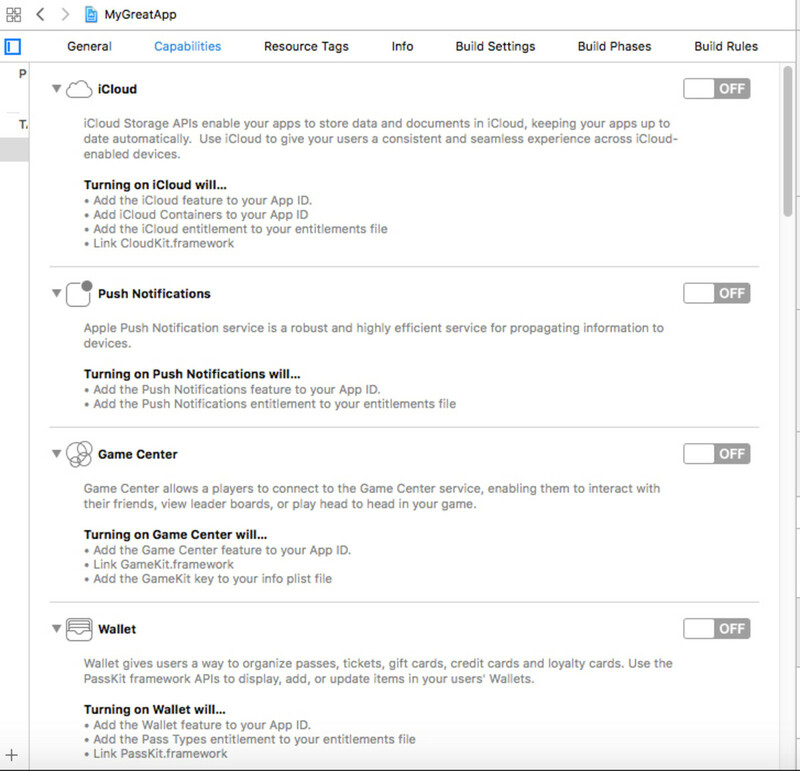 Xcode provides tools for creating and editing tags, adding and deleting the resources that are part of a tag, and specifying when the resources associated with a tag are downloaded by the operating system. Click to resource Tags tab and hit the + button to add on demand tags for your images. 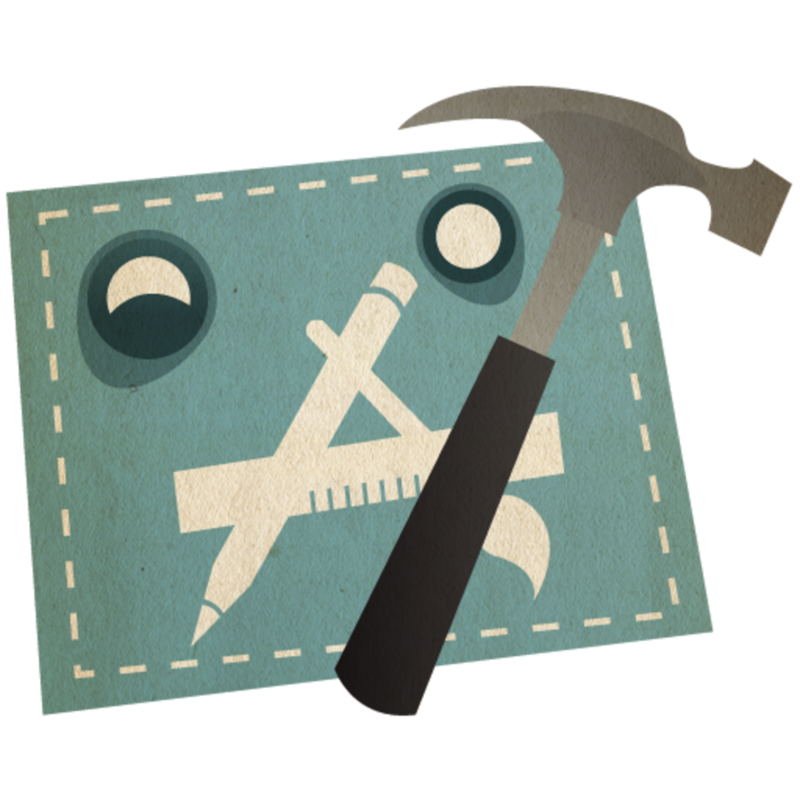 Thanks for reading, the first part of this guide ends here, there's a lot more to say about the tabs of the main Xcode section, so don't miss the second part of this article here! Don't forget to check out my other tutorials and my portfolio on CodeCanyon as well!